Poet’s Notes: This poem came to me on the subway, and I wrote it in about thirty seconds. I nearly missed my stop, as I had to pull out my notebook. I think I finished it when I was in the station, pressed up against the tile wall. I had the image of a man swallowing a snake down his throat flash in my mind, like one might swallow a live fish. I connected this to the symbolism that the snake renews itself with its shedding skin--that it becomes "renewed" by this process and becomes something fresh. By swallowing the snake, one would take the snake's power. 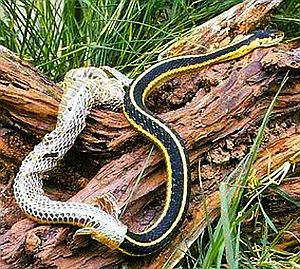 Of course, we also shed our skin, but it is a gradual process, so it isn't so much a resurrection as the snake's experience. In this way, the snake serves effectively as a "totem" of resurrection, incorporated into the self through the consumption and incorporation of its flesh. I think all of us could appreciate the idea of becoming something new and find ourselves realizing how hard that it is. I am not, in general, dissatisfied with my life, but even I have wanted to change things at times. Lastly, there is an oblique reference to Genesis 3:15 with the notion of enmity between the serpent and me. This reference was not supposed to hark back to the meaning of that passage, though, as the enmity as revealed is one of envy over the snake's ability to change, which we do not so readily possess.